Honey is the sweet viscous sticky liquid made by bees and other insects from the nectar that they have collected from flowers of plants and trees. The art of keeping bees and collecting the honey that these bees produce is one that has kept mankind supplied with honey over the years. When bees make honey, the honey is in the form of a honeycomb. A mechanical device is then needed to separate the honey from the honeycomb without doing damage to either the honeycomb and or the honey. That is where honey extractors come in. The first honey extractor on this list is produced by Mann Lake. It is constructed with materials that are high-quality stainless steel. This honey extractor has the capacity to hold three deep frames, three medium frames or six shallow frames. Depending on the type of frame, this particular extractor has three or six frames. It has a firm grip and textured hand cranks. It is about 26 inches in height and 18 inches in diameter. The included honey gate measures one and one-half inches for honey to pass through into the stainless steel bucket. It has the capability of holding about 10 quarts of honey. This honey extractor is great for extracting honey from your honeycomb without the honeycomb suffering any damage. For beekeepers with hives numbering anywhere between one to ten hives, the Goodland Bee Supply 2 Frame Honey Extractor is an indispensable tool for them. 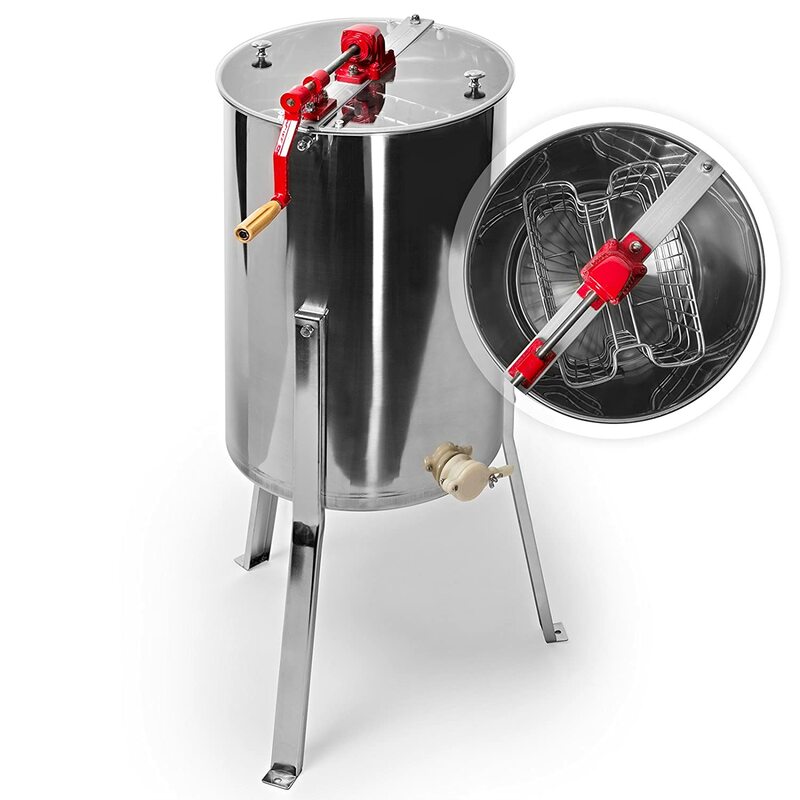 The tank is manufactured from 16 gauge, high-quality stainless steel. 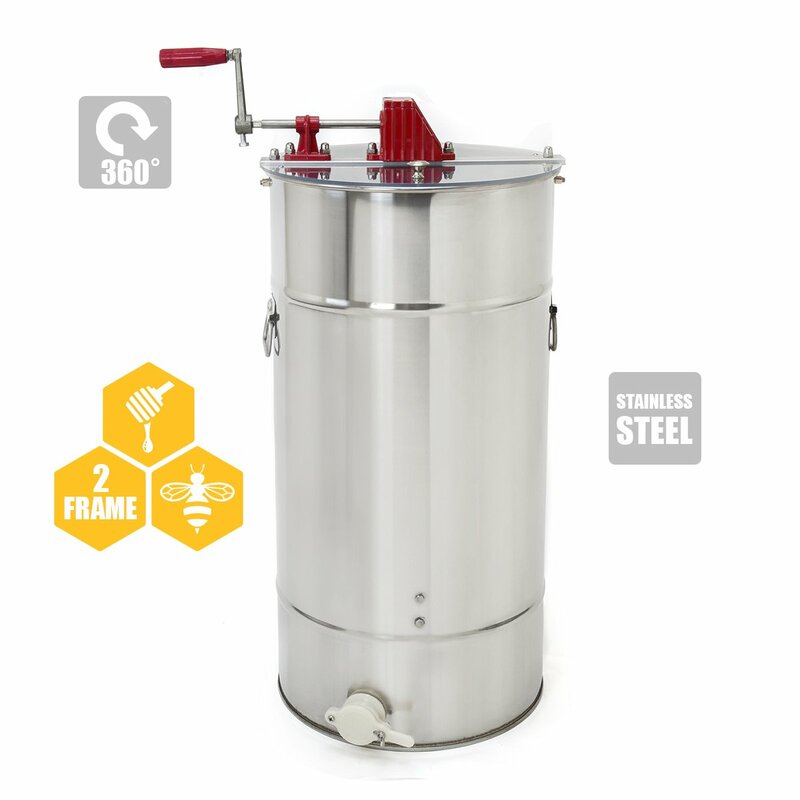 This honey extractor has bearings that are sealed and gears that are completely made of steel, giving this honey extractor a professional, strong and durable outlook. With this honey extractor, you can save time by extracting two frames at the same time, regardless of whether they are shallow, medium or deep. This extractor also has a leg stand that is three pieced to allow for easy offloading if the honey after the extraction process. The handle is made of firm grip wood for convenience and the metal bristles last for a longer time. These metal bristles have really long needles that can penetrate any honeycomb and ease the extraction process. Another plus of this honey extractor is the double-sieve design. The sieve allows for getting rid of every particle of wax that may have found their way into the honey. 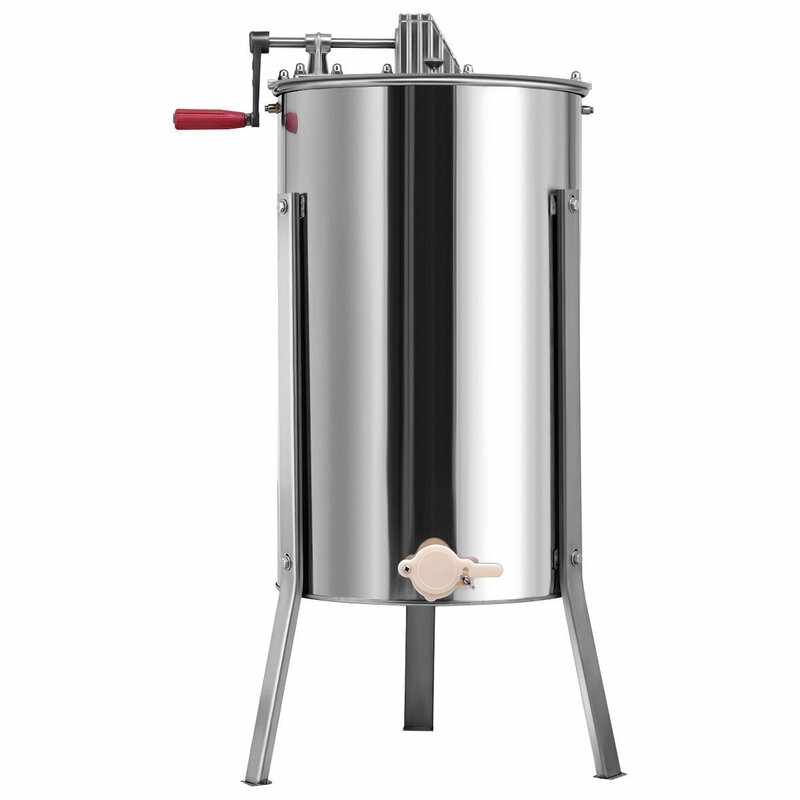 This 2-frame honey extractor, like most honey extractors, is manufactured from stainless steel. It comes fitted with dual clear covering lids and dual handles on opposite sides for easy moving around and transport of the honey extractor. The base of the stainless steel drum is shaped like a cone and this helps to channel the honey to the other outlet measuring two inches through the stopper. 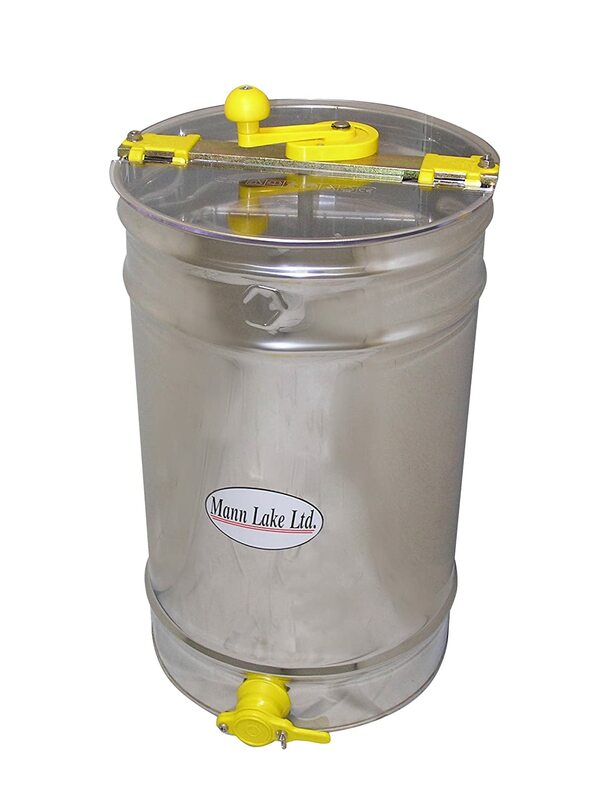 This honey extractor will be perfect for either shallow, deep or medium frames. It has completely covered metal gears that are protected from being covered in honey. It also features a bearing with a raised base that keeps it separated from honey that has been extracted. The handle is plastic and is grooved for comfort and an improved grip that requires minimal effort when extracting the honey. The stainless steel. Read More: Best Tea Kettles Reviews & Buying Guides. 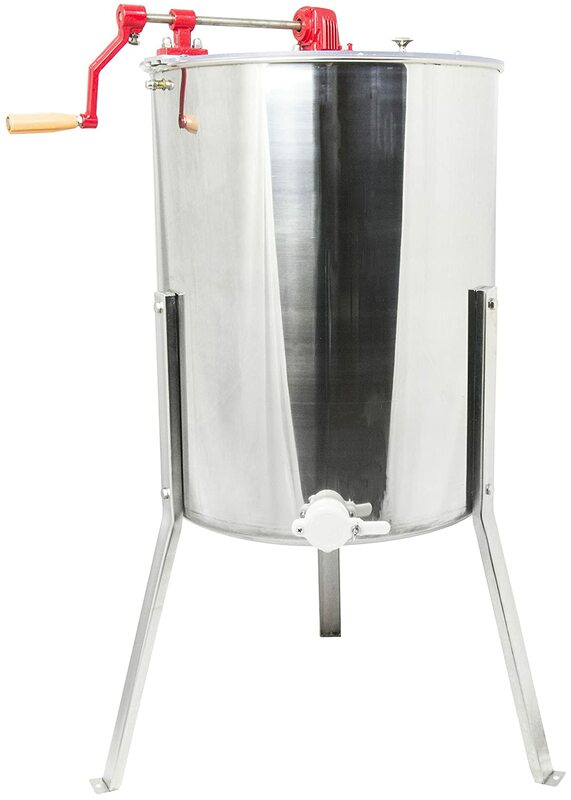 This manual honey extractor has a tank that is made of 16 gauge stainless steel. The covering is made of clear Plexiglas to aid and improve viewing from on top of the honey extractor. The gear construction is steel and all the ball bearings are completely covered and sealed up. This is to help prevent the occurrence of honey spilling or rubbing all over the ball bearings. There is a stand included but using this leg or stand is completely up to your discretion. It is good for owners of one to ten beehives. In this honey extractor, you can extract three frames at the same time. The stainless steel drum can easily be cleaned with soap and warm water. This extractor has a lifetime warranty. 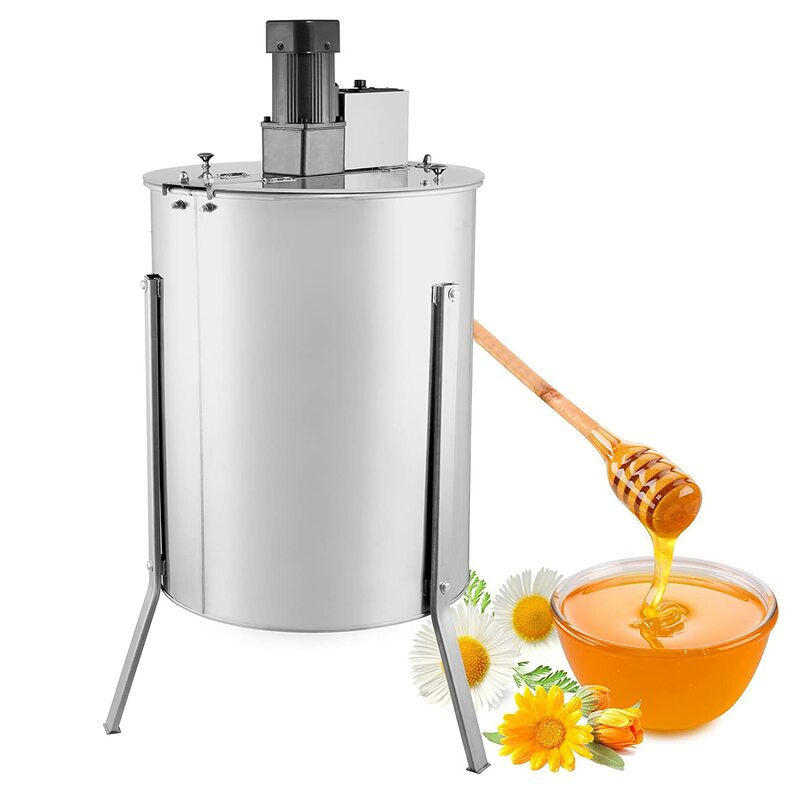 This honey extractor has the capacity to hold anything from 45 to 50 kg of honey. It is composed entirely of stainless steel that is rust-resistant and corrosion-resistant. It is highly durable, long-lasting and very practical. It can only accommodate the extraction of two frames at the same time. It fits frames whether they be shallow, deep or medium frames. The drum has a height of about 31 inches and a width of 16 inches. It is relatively easy to clean and it is low-maintenance. 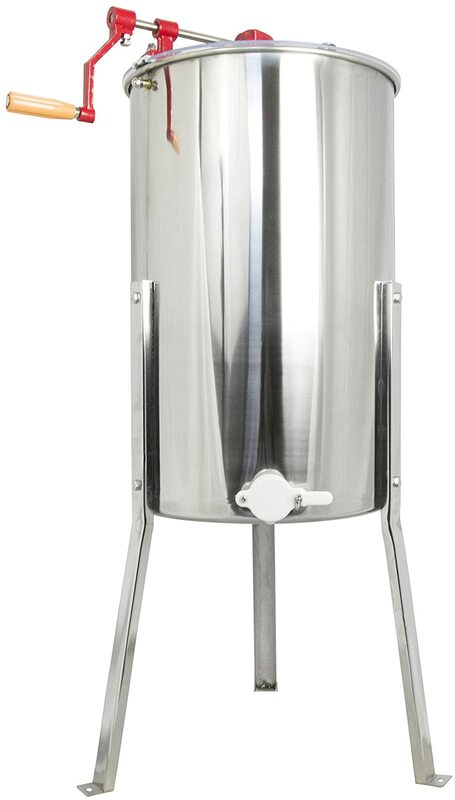 This two-frame honey extractor from Honey Keeper is made from rust-resistant, commercial grade stainless steel. 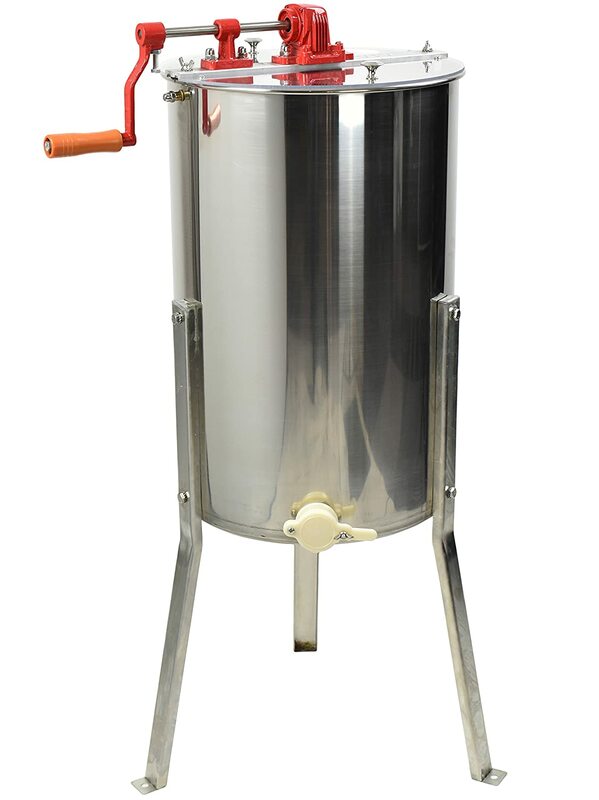 For beekeepers with one to ten hives, this honey extractor is perfect. It has two handles that can be used to lift, move and transport the drum. It can efficiently accommodate two shallow, medium or deep frames at the same time. It is easy to assemble and equally easy to use and has two transparent plastic covers to keep unwanted materials out and to offer a clear unhindered view through the cover and into the drum. The honey gate is at a convenient height of 15 inches. This is so that it can allow for at least a 5-gallon bucket to be positioned under it for easy draining of the honey. The bearings and metal gears of this honey extractor are sealed, thus making it easy for the spinning. This drum can easily be cleaned with warm water and soap. It is 42 inches in height and 23 inches wide. Read More: Best Coffee Makers Reviews & Buying Guides. This three-frame extracting honey extractor has a height of 24 inches. For any type of beekeeping and any number of hives, this honey extractor will come in handy. The body of the drum is made of stainless steel. The turn crack, on the other hand, is made of high quality, solid and sturdy metal and has a plastic handle that is ergonomic, soft and has a firm grip. This honey extractor features bevel gears that are spiral and made of durable metal. This results in a sleek, smooth and quiet spin. The honey gate measures at a distance of15 inches to allow for the positioning of a bucket under it to collect the honey. The honey extractor will fit deep, medium and shallow frames. The clear lid is double sided, composed of Plexiglas and it offers a free and unrestricted view into the drum. Said drum has a height of 24 inches and a diameter of 15 inches. Unlike most honey extractors that only have one lid, this GoPlus large honey extractor has two clear lids that keep dirt and impurities out of the drum, keeps the honey in the extracting drum and offers a clear and unhindered view of the entire extraction process from on top of the drum. 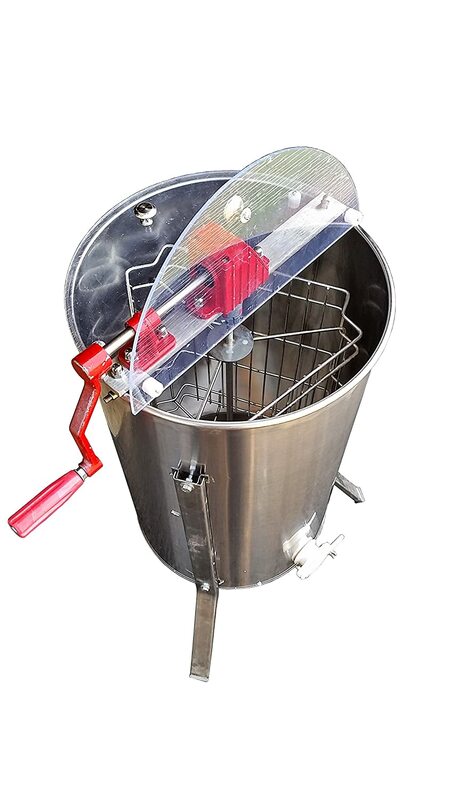 This honey extractor is perfect for low budget and small scale keepers of honey. It is small, simple, durable and will get the job of extracting honey from the honeycomb done in as little time as possible. It weighs only about 22 pounds and is about 24 inches tall and 15 inches in diameter. It is a two-frame extractor and can only take two medium or small frames at the same time. It is constructed with stainless steel, is easy to set up and use and can easily be washed by simply rinsing it out with warm soapy water. Unlike every other honey extractor on this list, this OrangeA Spinner honey extractor is electric. It does not need a handle to crank it but only needs are plugged into a power source. It runs on a 120Watt, 1.1Ampere and 1300 rotations per minute motor. It is constructed with food-quality, durable and safe stainless steel. The rotating speed of this motor can be varied considerably to suit your needs. The steel drum has a conical base that allows for the draining of honey into the honey gate. The honey gate is plastic and durable. This honey extractor also has two transparent Plexiglas covers to keep debris out, keep the honey inside and offer a hitch-free and unrestricted view of the process. The bearings on this honey extractor are high-precision. That means that not only does this honey extractor rotate faster than other honey extractors, it also has a longer lifespan. This extractor is tangential in the process, has a height of 85cm, a width of 38cm in diameter, allows two frames, is easy to install, is easy to use and has a one-year warranty. Read More: Best Electric Milk Frothers and Steamers Reviews & Buying Guides. This is another honey extractor from VIVO. It has a height of 42 inches and a diameter of 18.5 inches. It is constructed with high-quality stainless steel and metal gears. The bearings are covered and sealed to enable them to run more smoothly without getting any honey in the way. It also features a clear, transparent Plexiglas cover through which you can view the honey being separated from the honeycomb. This honey extractor can hold 8 medium and small frames. It can also hold about 4 large frames. The honey gate is at a distance of 15 inches from the floor so that a bucket can be placed under it to drain the honey out. 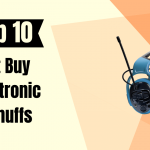 With most other products, there are a ton of qualities and characteristics to consider before finally choosing which one to buy. With honey extractors, this is not so. 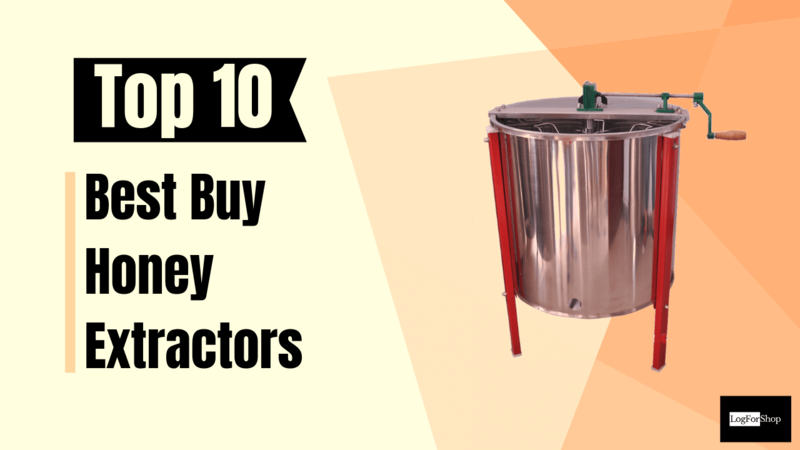 There are only just one or two things to consider when buying a honey extractor. The most important thing is the size of the extractor and the number of frames it can accommodate. For apiarists with about 10 colonies, an extractor that can fir three frames simultaneously is good. 50 colonies would require an extractor that can fit 8 shallow frames and 4 deep frames. 200 colonies would need big radial extractors and so on. You could choose between electrical honey extractors and manual honey extractors, depending on how man beehives or colonies you have. 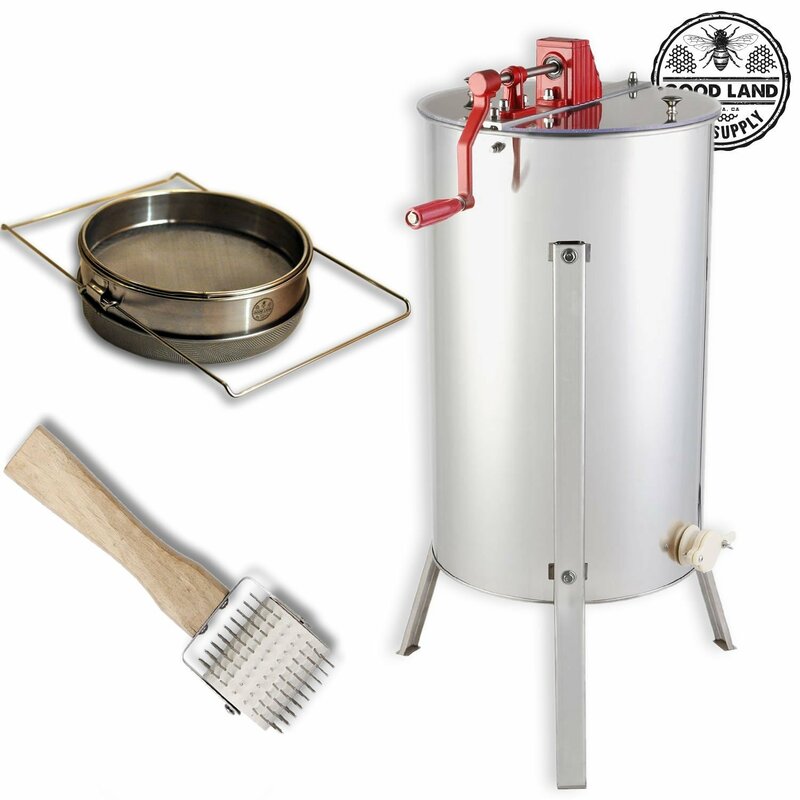 Honey extractors are mainly made of materials like plastic, metal and the best of all, stainless steel. The practicality and durability increase from plastic to metal to stainless steel and so does the cost. For hobbyists, it is best to buy a plastic honey extractor. The bottom of your honey extractor should be conical to allow for easy draining out of the honey. Buy honey extractors that are low maintenance, easy to set up and easy to clean. 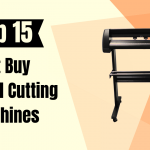 Also, stay within your budget and do not overspend on honey extractors. We do hope that you now know what the best honey extractors are and the list of things to consider before buying that much-needed honey extractor. Thank you for reading our review.